LACUSL is proud to co-sponsor this community event featuring Aja Monet and introducing Maroon Calabash, Afro-Indigenous Birthwork Cooperative. Event Details: Maroon Calabash, Afro-Indigenous Birthwork Cooperative invites you to their debut event, An Evening with Aja Monet! We invite all people, families, and community members to this Black and Brown womxn centering event. Come learn about our birthwork cooperative, our services, and how we are carving out intentional and necessary space in Milwaukee. 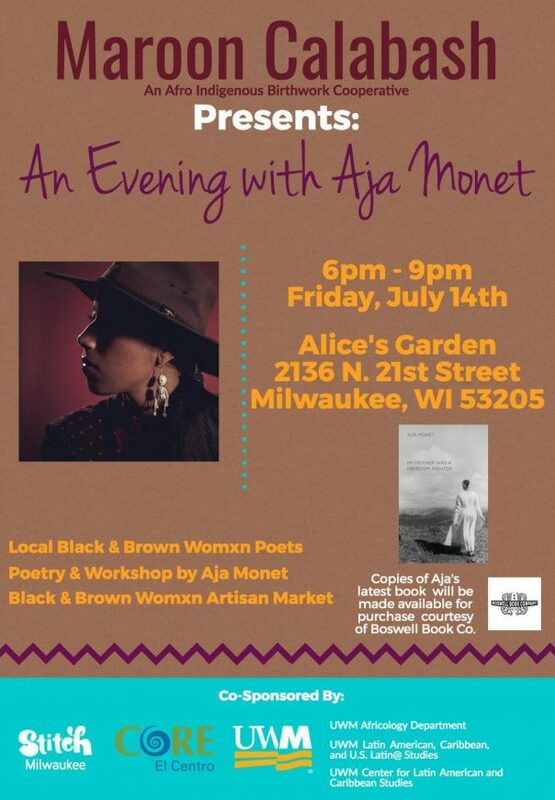 The evening will feature a Black and Brown Womxn Artisan Market, a workshop with Aja Monet, performances by local Black and Brown womxn poets, and our guest and guerrera, Aja Monet reading from her latest book, My Mother Was a Freedom Fighter. Aja Monet, of Cuban-Jamaican heritage, is an internationally established poet, singer, performer, and educator, Monet’s craft is an in-depth reflection of emotional wisdom, skill, and activism. The youngest individual to win the legendary Nuyorican Poet’s Café Grand Slam title, she is recognized for combining her spellbound voice and powerful imagery on stage. Her books of poetry are My Mother Was a Freedom Fighter (2017), Inner-City Chants & Cyborg Cyphers (2015), and The Black Unicorn Sings (Penmanship books). Her first CD, Scared to Make Love/Scared Not To, a testament to her creative lens and a social commentary on the discussion of love, was independently released through Bandcamp. My Mother Was a Freedom Fighter will be made available for purchase byBoswell Book Company. HUGE thank you to our co-sponsors for supporting us in making this event FREE and possible: STITCH Milwaukee, University of Wisconsin-Milwaukee/Department of Africology, CORE El Centro, UWM Latin American, Caribbean, and U.S. Latinx Studies, and the Center for Latin American and Caribbean Studies, UW-Milwaukee.